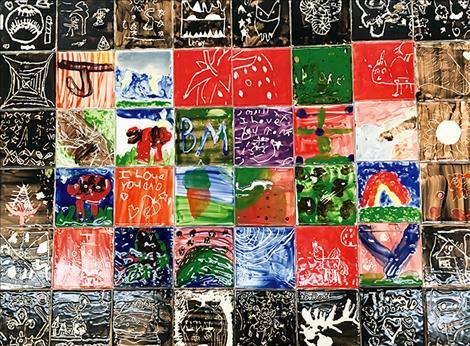 An example of art work by Barnaby Smith's "budding artists." 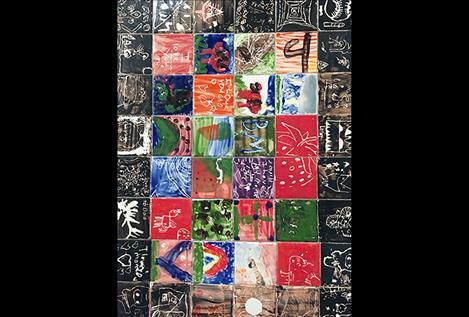 NINEPIPES — Barnaby Smith, the art teacher at K. William Harvey Elementary School, has been sharing his passion for art with both children and adults alike since his arrival in Ronan in 2009. Smith arrived in Ronan after teaching art to high school students in Missouri and other schools following graduation from Concordia College in 1996. As if teaching over 400 students in first through fourth grades wasn’t challenging enough, Smith taught a series of adult art classes at Dobson Creek Coffee House this past winter. A schedule such as this leaves little time for Smith to practice his own art as he feels compelled to feed the desire of budding artists. One of his dreams is to have a series of classes that involves both young and older students in the sameclassroom, where the strengths of each group will benefit the other: young students will learn about patience and perseverance, and older students will be energized by the young artists. 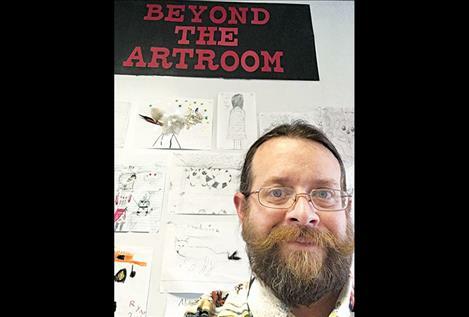 Smith will bring some of his students’ work to the Ninepipes Museum of Early Montana as part of its “First Saturday” schedule. Painted clay tiles from the elementary school students and samples of string art, big loom weaving, and metal sculpturing from his adult classes will be on exhibit Saturday, May 5 from 10 a.m.-4 p.m. Smith fires the clay tiles on site thanks to a kiln donated to the school by the Indian Education Committee. He recently completed the installation of stepping stones created by students alongside the school.